Are You Guilty of Wasting Readers’ Time With Bad Content? Are you a marketing manager and an expert on writing blogs? If so, you probably never waste a reader’s time, which is fantastic. We in O’C&K believe that we don’t deliver bad content but still, we’re going to be honest with you about why we’re not experts. After that, we will share our thoughts on better blogging. Why we might not be considered blogging experts is the fact that we don’t always stick to an editorial calendar and we don’t publish every day or even once a week! Furthermore, when we do publish, we don’t distribute it through every channel available on the internet. And, shock-horror, our rationale, in writing a blog, is not to solely generate leads. On the positive side, though, we don’t produce low-quality posts as often as possible, just so we can tick a job-done box. And what’s more, we never sell our outsourcing services in the body of a blog post, (but do have a call to action at the end, if readers would like to chat to us). For us, producing quick fire content for the sake of it, can lead to bad content. This approach would probably do our business more harm than good in the long run, anyway. Bad content = bad marketing. Good content takes time and effort and let’s face it – it is not (time) cheap either. Plus, we all know what Google thinks (and does) with bad content. Bad content = bad marketing. When Aidan and myself agreed to commence this blog we agreed on three things a) we would host it on our own site, b) the content would be helpful (good) rather than conveying a marketing message (bad) and c) we would only write about marketing topics that we have expertise in or experience with. Of course, hosting it on our own site may drive additional traffic with the potential for lead generation and we won’t turn that down. In the main, however, the content of our blog, and its intention, is to reflect our brand value of being relevant to our customers and businesses in general. We firmly believe in the mantra that helping people with something that matters to them will provide business reciprocity, in due course. Bad content just wastes a reader’s time. Let’s face it most customers don’t really need another blog post. What they do need is a source of relevant ideas that will help them get better at something. If you can use your expertise to help them, that’s great. If not – don’t waste people’s precious time with irrelevant content. Have you experienced any of these? Well, if you want to continue reading here, we’ll provide 6 suggestions on what we think will help you avoid wasting a reader’s time (and your own). If your blog isn’t structured to produce revenue, then it should, at least, play an integral part in raising awareness for your brand. There is no need to throw yourself beneath the feet of the content king, however. General guidelines will help but not a rigid plan, in our opinion. For instance, we limit our posts to 4 general areas of marketing (brand, digital, engagement and offline), but not to specific topics. Thereafter, we distribute our blog posts, not only on specific online platforms, but also seek out speaking opportunities and networking events. At such events we direct people to our blog, should they want to find out more on a topic. It is important, though, that each post is repurposed so as to engage different audiences e.g. we will share a shorter version of this post as just tips (below) on LinkedIn Pulse, Medium and Bizsugar. These misconceptions can be easily dispelled (maybe we’ll attend to this in another post) by marketing managers who understand inbound marketing. Perhaps you can also give examples of some tools that can explain the methodology e.g. These tools help to keep a focus on making the post relevant to your customer through automation and customisation. Of course, you should know who your customer really is, so that you can show genuine empathy with them. The idea is to build quality relationships by helping them with their pain points using your expertise. By the way, an expert in online tools is a fellow Irishman Ian Cleary. Ian does a fantastic job sharing the most up-to-date, online tools available for your business. Check out his site at RazorSocial. As mentioned, blogging is one way of allowing other people benefit from your experience. The more you share good content, the more people will pay attention to what you can do and the more they interact, the stronger your relationship will become. Be generous. If you have something free to give away – just do it without hiding it behind a lead capture gate. People should finish your article feeling informed, educated or entertained. Blogging with good content will form a major part of your online success. Stick to areas that you are an expert in and people will get to appreciate your advice when they require it. You owe it to yourself and your readers to produce the most effective content you can. Before you know it you will increase your professional exposure, boost your reputation and guess what – you might even enjoy it too. 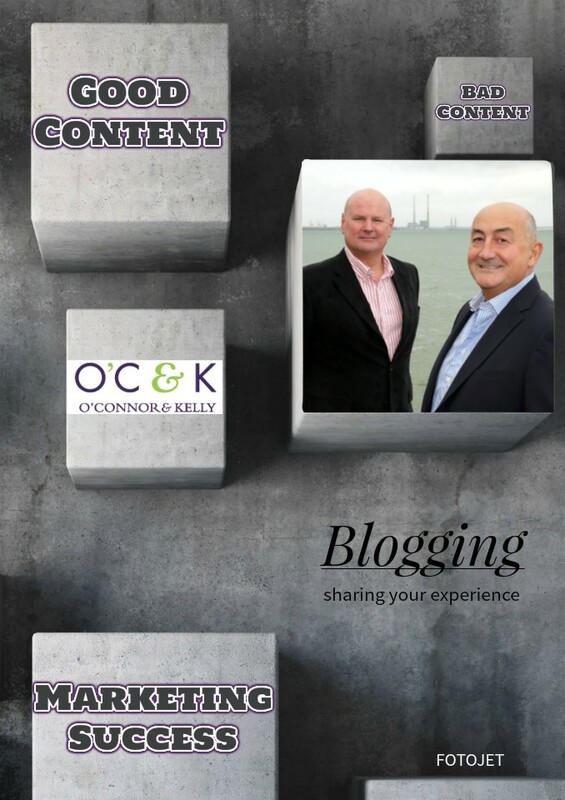 “Thank you for reading our blog post today” – Aidan & Jim. This entry was posted in Engagement & Content Marketing and tagged bad content, blogging tools, content marketing, publishing on January 29, 2016 .